Steph Su Reads: Friday Featured Blogger (14): Beth Revis! Beth is the incredible blogger slash teacher slash aspiring author who runs Writing It Out, a great blog for writers at any stage of their craft. She writes brilliant reviews and conducts wonderful interviews with great authors (did you check out the one for Eyes Like Stars by Lisa Mantchev? Amazing! ), and she also likes to share anecdotes from her class, as well as pose questions that make us thinking about our writing. After several months of getting to know her, I'm so excited to welcome Beth to Steph Su Reads! 1. Hello, Beth! Tell us about yourself in a few short sentences. My name is Beth and I live in the South in an area so rural that my nearest neighbor is a goat. My other neighbor is a cow. But, as Robert Frost always said, good fences make good neighbors, and that is very true around here. I live with my husband and my dog, one of which slobbers a lot and both of which snore a lot. In the day I teach world literature to high school students, dream about summer writing time, and record my students' funny comments on my blog. Occasionally, when not grading essays, I write YA science fiction and fantasy. I started blogging a little over a year ago. I decided to blog because I want to get my book published. To do that, I need to write a query letter for agents. In that query letter, there's a section for writing credits...and I have none. I'm crap at short stories (they always turn into novels for me) and I'm crappier at magazine articles. But I can write about writing. I blather on about writing from 8:00-3:00 every workday, after all, and I quite enjoy that. So I set out to make my blog be my writing credential to my query. What I didn't expect was that I would love blogging. There's a real community of writers online, all connecting primarily through blogs. I found all but one of my critique partners online, and have been able to connect with writers at all stages of their writing career. When I started blogging, I figured that writers were, by and large, strange, mysterious people living in ivory towers who sneered down upon us lowly masses. But they're not. I'm still amazed at writers (real! life! writers!) who recognize me on Twitter, or who know my name already when I meet them at book signings. I recently offered to distribute bookmarks for Diana Peterfreund's new book RAMPANT at my school, and she included a personal note with the bookmarks where she mentioned that she read my blog. How amazing is that?! Ugh, I'm prattling on. But if anyone's interested in my blog, they'll find interviews and book reviews occasionally, comments about writing and publishing more often, and, during the school year, "Today in Class" posts about the random hilarity that ensues in my daily teaching life. 3. That was very interesting, your unique start to blogging! Now, as a teacher, have you been able to use YA/MG lit in your classroom? If so, how? If not, do you want to? ABSOLUTELY. I was a little nerdy girl in high school, and the teachers I loved best were the ones who recognized the books I read secretly tucked in the pages of my textbook. I'm always alluding to the authors they read. If I see a kid reading a book, I seek out that book and read it, too. A lot of kids come to me for book recommendations. But, actually, connecting current YA lit with the classics has been some of the best methods of teaching. Recently, my kids read GILGAMESH. Boring. Even I hate that one. But when I told them about the Ancient Sumerian beliefs behind the literature, and how fascinated that culture was with death--to the point of actually having stories about vampires--well, I happen to know that most of the girls in the class liked a certain vampire series, and even if they weren't fascinated with GILGAMESH, they won't forget about his obsession with immortality and how he was a product of a culture that was equally fascinated with vampires. 4. I know you're an aspiring author. What are your writing habits like? Can you give us a 3-sentence summary of one of your WIPs? I'm a deadline girl, but I'm also very realistic. Those two aspects work hand in hand with my writing. I give myself deadlines based on my life, which has vastly different schedules. For example, I knew that I'd be starting school back up in August, so I worked daily in the summer to get my most recent WIP edited and revised. I knew I couldn't focus on it when school started, so I forced myself to finish before then. I don't set daily goals. I can't work like that. But if I know I need to have at least a rough draft done by a certain date, I do it, usually cramming in a whole bunch all right before the deadline. A quick pitch of my current WIP: A murder mystery...set in SPACE!! OK, a bit more serious of a pitch: After waking up decades before her cryostasis was supposed to end, a teen girl must stop a murderer from killing the other frozens trapped on the space ship before her parents are unplugged. 5. I'd want to read that! Now quick! Name 3 favorite books and why you think everyone should read them. The Harry Potter Series: There's a reason why they're so popular. They're that good. But it's the writing more than the story that makes these books good. The intricate, tied-together-plot. The gun-on-the-mantle that always goes off in an unusual way. The clever, detailed world-building. And, perhaps best of all, the subtle layer of humor surrounding nearly everything. 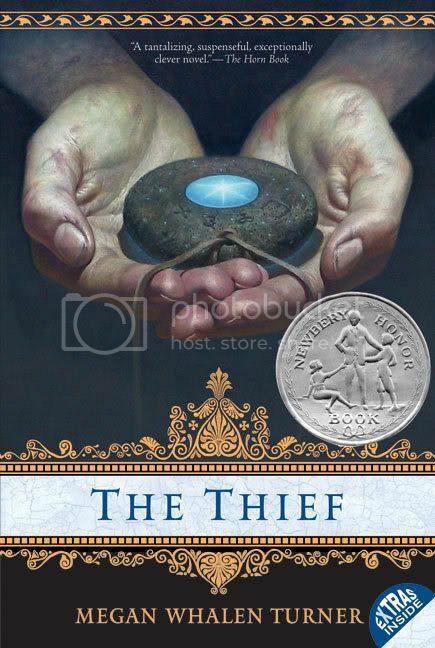 THE THIEF by Megan Whalen Turner. I won't give anything away about this one, but it's brilliant. Just brilliant. The epitome of clever writing. 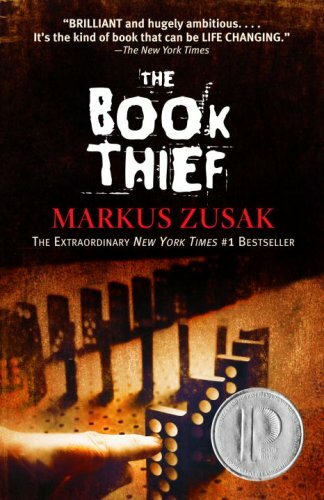 THE BOOK THIEF by Marcus Zusak. Because it's just beautiful. And the world needs beautiful writing. 6. What are some authors/books that have influenced your own writing? For my current WIP, THE ADORATION OF JENNA FOX by Mary Pearson. Despite the fact that I just finished editing a YA science fiction, I, er, don't like science fiction. AT ALL. I thought SF was huge, political, epic messes set in space. But THE ADORATION OF JENNA FOX was a SF that was about a girl, a character, and how science affected her life. I was blown away by how simple she made the genre look, how effortlessly she created the world and the characters...and that, more than anything, was what made me realize that SF didn't have to be 800-page tomes that were allegories about communism or whatever--they could just be clever stories about characters who stumble upon science in much the same way as Harry Potter stumbled upon magic. Another influential one for me was Jeanne du Prau's THE CITY OF EMBER. I loved how she had a contained mystery, much like some of the classic Agatha Christie books (MOUSETRAP, anyone?). And I thought, what better way to make a contained mystery than on a space ship? 7. What superpower would you love to have, and why? Control of time! There's so much to do, and never enough time! I'd stop time just to read--and to write! 8. What's a book that made you cry? There are certain lines that, just reading them, reminds me of that empty place in my heart that grieves for characters. It is this line that made me cry so hard, that I actually had to put the book down and walk out of the room to compose myself. I *wept* at this scene. From HARRY POTTER AND THE ORDER OF THE PHOENIX: "But some part of him realized, even as he fought to break free from Lupin, that Sirius had never kept him waiting before...that Sirius had risked everything, always, to see Harry, to help him...If Sirius was not reappearing out of that archway when Harry was yelling for him as though his life depended on it, the only possible explanation was that he could not come back..."
This isn't actually the line that broke me, but what the main character does next...but I don't want to ruin the story for you. From THE BOOK THIEF: "He lay with yellow hair and closed eyes, and the book thief ran toward him and fell down." I first read this line when I was in junior high. I read this book every year after that, on my birthday, until after college. This line touches me on a deeply profound level...I will sometimes go to this book, open to this page, and read this one line over and over again to myself. The book naturally falls to this page in my hand. From THE HERO AND THE CROWN: "She screamed, except that she could not scream, but she made a hoarse awful sound, and Tor dropped his hand and said something she did not hear, for her scream made her cough, and she coughed and could not stop, and the bleeding began, and flecks of her blood dripped down Talat's neck, and her body shook, and the cloak fell away from her and onto the ground, and Tor and Arlbeth sat frozen on their horses, helplessly watching." Also: ponies. I've been asking for one since I was like five, and loved My Little Ponies. I never got one. But I still ask for one! 10. Finally, what are 2 things about yourself that can spark conversation? My shoulders are double jointed, so I can pull a Houdini and twist my arms around so my elbows stick out in front of me. I can, actually, clap my elbows together much like you can clap your hands. Which is freakish, I know. But if my class isn't paying attention to me, I have been known to twist my arms and waggle my elbows at them until they shut up in awe. Ohh! Here's another gross one. I had my tonsils taken out in college, and they were so "medically interesting" that they are on display in a jar in Raleigh, NC. lol! at your answers to the last question, Beth! Thanks for such an interesting interview! Readers and writers alike should check out Beth's blog at Writing It Out for endless moments of intrigue and fun! Wow- tonsils in a jar??!!! Wow, another book to add to my feed reader! Great answers, too! I also really enjoyed The Hero and The Crown. It was given to me as a gift and I don't think I would have picked it up on my own, so I am VERY glad to have had it "forced" upon me. I will look for your books in the future, Beth! Excellent interview. I'd put a cap on my google reader after BBAW but I think I just have to add one more. Beth's blog sounds great. I love Beth's blog! Definitely an excellent choice. This is a fabulous interview. Beth's blogging story is so fascinating! Great interview, Steph and Beth! Wow about the tonsils & double-jointedness. Absolutely AWESOME that Robin McKinley is a favorite of yours. I love learning that other bloggers have the same (good) taste. Great interview! What a great interview! Beth's blog is new to me, but I'm off to check her out right now.